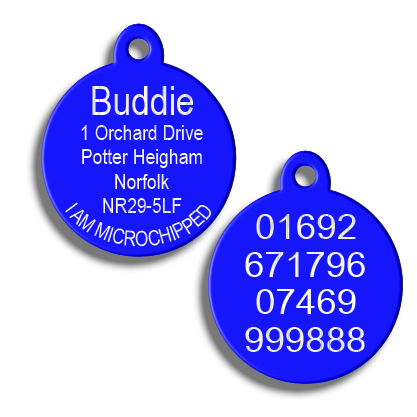 Blue Aluminium Round pet id tags with tab. Deep Engraved on Both sides with your contact details and posted within 24hrs after receiving your order. These tags are coated with 7 microns of tough anodised colour that will last. These Tags are available in 4 sizes. 20 mm ( only use 2 lines of text at 12 characters per line on each side or the text will be small to read. 25 mm ( only use 4 - 5 lines of text at 12 characters per line on each side or the text will be small to read. 30 mm ( only use 5 - 6 lines of text at 12 characters per line on each side or the text will be small to read. 38 mm( only use 5 - 6 lines of text at 12 characters per line on each side or the text will be small to read. The above is just a guide. We will engrave what you require but if you go over the above limits the text may to too small to read easily. All our tags come complete with a split ring for fixing.